After a lengthy heads-up battle, Jason Dewitt outlasted Sam Trickett to take down the $5,000 No-Limit Holdem bracelet, earning $818,959. Trickett picks up $505,725 for the runner-up finish, with Jeff Williams third, good for $328,762. The full list of results can be found at wsop.com. Ten remain when the $10,000 No-Limit 2-7 Lowball World Championship resumes Friday afternoon with David “Bakes” Baker leading with 526,000 in chips. The rest of the field is full of big names, including Erik Seidel (280,000), John Monnette (238,000), John Juanda (225,000), Daniel Negreanu (223,000) and Andy Bloch (146,000). To follow the action and get chip count information, check out PokerNews. Day 2 of the $1,500 Pot-Limit Omaha resumes at 2:30pm with Jonathan Little leading the 95 day 1 survivors holding the chip lead with 129,600. Some familiar names returning include Christian Harder (116,100), Nenad Medic (104,400), Peter Costa (70,400) and Scott Montgomery (57,000). The full list is available at PokerNews. After eight levels of play during day 1 of the $1,500 Seven Card Stud, Scott Seiver is the overwhelming chip leader (63,800) with 114 players returning at 3pm. The closest competitor is James Kadlec (40,500), with Carlos Mortensen (32,500), Chip Jett (27,000), Cory Zeidman (21,000) and Marco Traniello (19,000) some familiar foes also returning. The full list of chip counts will be online at PokerNews. Starting at noon today is the $1,000 Ladies’ No-Limit Holdem Championship. Last year, Lisa Hamilton defeated a field of 1,060 earning over $195,000 for the win. This event always leads to discussion about ladies’ events, from those who feel it helps get more women into poker, helping to grow the poker community. Those against the events feel it’s patronizing towards women and that it doesn’t really help grow the game, some prefer ladies’ only events instead of having to deal with the attitude some men have against female players. With the recent trend of men playing and winning ladies’ only events, as noted here and here, the question is if any men will try to enter this year’s event and be successful. The $2,500 Limit Holdem 6-max, gets underway at 5pm. Last year’s winner was Brock Parker, who topped a field of 367, picking up $223,697. The $10,000 Seven Card Stud World Championship was won by Men “The Master” Nguyen defeating Brandon Adams heads-up to win his 7th WSOP bracelet and $394,807, moving him into a tie for 5th place with Phil Ivey and Billy Baxter. The full results and Nolan Dalla’s tournament report are now online at wsop.com. James “Flushy” Dempsey wins his first WSOP bracelet, in the $1,500 Pot-Limit Holdem event, defeating Steve Chanthabousay heads-up to win $197,470. A complete list of results plus Nolan Dalla’s report is at wsop.com. Day 3 of the $1,500 No-Limit Holdem has Tom “Durrrr” Dwan the chip leader (1,068,000) with 21 players remaining. Play resumes at 2:30pm to play down to a winner and PokerNews will be following all the action. Day 3 of the $1,500 Limit Holdem event has 13 players returning at 3pm to play down to a winner. Jason Potter moves into the chip lead (371,000) followed by day 1 chip leader Jameson Painter (307,000) in second. Terrence Chan (288,000), Matt Matros (272,000) and Frank Kassela (162,000) are the other notables returning this afternoon. Find all chip counts and live updates this afternoon over at PokerNews. Day 1a of the second$1,000 No-Limit Holdem played about halfway into level 9 this morning, with 278 players, about 15% of the field, returning Monday at 2:30pm. This decision was made after last weekend’s $1,000 event had players getting eliminated too quickly, a problem Tao of Pokerati discussed with Ty Stewart. The current chip leader is Andy Black (90,275), with Phil Gordon (44,225), Jena Delk (34,300), Shaun Deeb (26,850), Victor Ramdin (23,350) and An Tran (20,350) are some of the recognizable names returning Monday at 2:30pm. The full list of players and their chip counts is now available over at PokerNews. A field of 67 returns Sunday afternoon at 3pm for day 2 of the $1,500 No-Limit 2-7 Lowball, Single Draw with Nick Binger the leader with 54,300 in chips. Scott Seiver is in 2nd with 46,875, with Chino Rheem in 3rd with 42,725. Other notables include Dario Minieri (31,725), 2-7 Triple Draw Lowball winner Peter Gelenscer (21,925), Michael Binger (17,350) and Erick Lindgren (16,600). Only 28 make the money, with the winner earning $92,817. The full list of players counts is at PokerNews. Starting at 12pm is day 1b of the $1,000 No-Limit Holdem event, will there be a smaller field like last week? The 5pm tournament starts the $10,000 Seven Card Stud Hi/Lo World Championship. Jeff Lisandro won this event last year in a field of 164, one of the three he won in 2009. Plenty of big names are expected to turn out for their chance to win a bracelet without so many donks in the field. Jeff Lisandro becomes the first player to win three bracelets in one WSOP after Chris Moneymaker initiated the poker boom in 2003, takes down the $2,500 Razz event, good for $188,370. Lisandro has won all three of his bracelets in stud events in each of the three disciplines of stud (Stud high, Stud Hi/Lo and Razz). Lisandro held the chip lead at the beginning of the day and was never seriously threatened. Michael Craig finished in 2nd, good for $116,405. Other notable finishes: Kenna James (6th), Al “Sugar Bear” Barbieri (10th), Ville Wahlbeck (12th) and Nikolay Evdakov (13th). Half a dozen players remain in the $1,000 Seniors NL Holdem World Championship, led by Scott Buller with over 2 million in chips. Michael Morusty, Charles Simon, Dan DeLatorre, Michael Davis and Barry Bounds make up the remaining players. The $2,500 Omaha Hi-Lo 8 or Better has 70 players remaining, only 45 get paid. The unofficial chip leader is Frankie O’Dell (109,000), followed by day 1 chip leader Josh Schlien (85,000), Pat Poels (71,500), Marsha Waggoner (54,000), Mike Matusow (38,000), and Max Pescatori (28,000) among the familiar faces. Thang Luu unfortunately was eliminated before the dinner break earlier today. The $10,000 Pot-Limit Holdem World Championship is down to 35 players, only 27 get to cash with day 1 chip leader Michiel Brummelhuis remaining chip leader (570,000). Isaac Haxton (450,000), Eric Baldwin (430,000), Darryll Fish (310,000), Vanessa Rousso (280,000), Sam Simon (173,000), and Eugene Todd (165,000) are among the remaining. The $2,500 Mixed Holdem event drew a field of 527 players, of which just 184 remain. The unofficial chip leader is David Baker (unknown if that’s the one from Michigan or Texas) at 73,000. Eli Elezra (51,000), Marc Naalden (46,000) and Jean-Robert Bellande (42,000) are some well known folks with chips. More updates during the evening over at www.wsop.com and Pokerati for more Lisandro stuff and other commentary about all things WSOP. Just happened … more TK. Not so fast Ville Wahlbeck and Brock Parker … Player of the Year race ain’t over yet! Oh, right … the event: $2,500 Omaha/Seven Card Stud Hi/Lo 8-or-better … or as I like to call it, OHL/7CSHL. (LOL.) The guy he beat was Ming Lee (not to be confused with Minh Ly). The $1,500 7 Card Stud event saw Jeff Lisandro make quick work of the final table, taking home his 2nd bracelet along with $124,959 in winnings. Rodney Pardey was the final victim to Lisandro, taking home $77,230 for his 2nd place finish. Pardey’s nephew Eric Pardey was also at the final table finishing in 6th place. Nick Frangos (4th) and John Juanda (5th) were two of the more notable names at that final table. The $5,000 NL Holdem final table will be returning from dinner break shortly with five players remaining. The chip leader is Fabian Quoss with over 3.4m in chips. Brian Lemke, Thomas “Thunder” Keller, Mike Sowers and Ivan Demidov’s girlfriend Lika Gerasimova round out the quintet. The final table is airing on ESPN360 as well as wsop.pkr.com for those overseas who are still awake. The $1,000 Ladies NL World Championship is now under 50 players, with Lisa Hamilton the chip leader (245,000). Notables remaining include Day 1 chip leader Tamara Tibbles (190,000), JJ Liu (78,000), Lisa Parsons (46,300), and Karina Jett (45,000). Players will try to play down to their final table or the next few hours for a possible streamed final table. The $10,000 Omaha 8 or Better World Championship has 41 players remaining, as they also try to get to a final table tomorrow before the 3am deadline. Sam Khouiss is the current chip leader at 360,000. 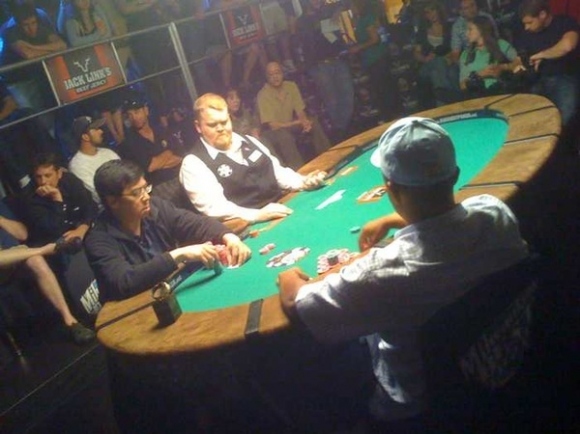 Notables remaining include Scott Clements (240,000), Ville Wahlbeck (190,000), Phil Ivey (165,000), Jean-Robert Bellande (150,000), Annie Duke (114,000) and Phil Hellmuth (105,000). The $2,500 NL Holdem 6-max event drew a field of 1.068, a slight increase over last year, with 370 players remaining. The unofficial chip leader is Layne Flack with over 80,000 in chips. Brock Parker, a former Magic the Gathering player, knocked off Daniel Negreanu heads-up to take down his first bracelet in the $2,500 Limit Holdem 6-max event last night. Keven “Stamdogg” Stammen bested Angel Guillen to collect over $500,000 and his first bracelet in the $2,500 NL Holdem event. Our Pokerati cohort Robert Goldfarb finished 29th for $2,945. Monday’s other final table will take place later this afternoon in the $5,000 NL Holdem event. Faraz Jaka was the last player eliminated when the clock struck 3am, and with 17 players remaining, Isaac Baron is the chip leader (1,101,000). Other notables remaining: David Pham (880,000), Mike Sowers (583,000), Liya Gerasmova (527,000), Lars Bonding (365,000), Thomas Keller (314,000) and David Benefield (239,000). The players will be returning at 12 noon tomorrow, which didn’t make Bonding or Keller too happy about hearing that news, as this will be streamed on ESPN360 and PKR later this afternoon. The $1,000 Ladles NL Holdem World Championship returns with 146 remaining, of which 117 get paid. The reported chip leader is Tammy Tibbles, with 129,700 in chips. Defending champion Svetlana Gromenkova is in 2nd (62,200). Other notable ladies returning at 2pm today include: Lisa Parsons (46,300), JJ Liu (38,300), Susie Isaacs (32,600), and Maria Ho (24,800). The $10,000 Omaha 8 or Better World Championship returns with 129 players remaining, 111 of which will leave with nothing. Chris Bjorin is the day 1 chip leader at (134,400) with Scott Clements (130,800), defending champion David Benyamine (94,800) and Phil Hellmuth (83,700) in the top 10. Selected notables include: Phil Ivey, (80,000) Thang Luu (63,400), and Matt Savage (60,100) among the returnees at 2pm today. Only one tournament today, the $2,500 NL Holdem 6-max event. Last year, it was won by Dario Minieri in a field of 1,012 for over $528,000. The WSOP Staff Guide projection for this event was set at 1,113. With the recent downward trend in tournament entries, take the under expecting just over 1,000 to take to the felt. That’s all for me, but more stuff can be found at Pokerati during the day.